"No baseball summer is as memorable for me as that July when the Dodgers began a winning streak in a suddenly torrid, topsy-turvy National League pennant race." Fifty years after they played their last baseball game, the Brooklyn Dodgers are still remembered by millions of people. 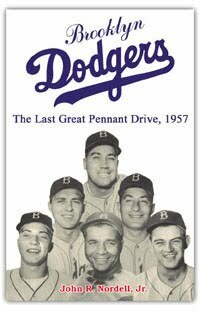 From 1947 to 1956 the Dodgers captured six out of ten National League pennants and they defeated the mighty New York Yankees in the 1955 World Series. The year 1957, however, is recalled mainly for the decision by Dodger president Walter O'Malley to move his team to Los Angeles the following year. Author John Nordell tells the story of the Dodgers' mid-season surge in the standings during that last year in Brooklyn. Using research from a variety of sources, Nordell recreates the excitement of following the Dodgers and their National League rivals in the daily drama of a five-team pennant race. The author also draws on his own youthful memories of that year and describes the unforgettable thrill of seeing a game at Ebbets Field. The book includes numerous photographs and a concluding chapter that discusses the outcome of the 1957 pennant race, the major factors and personalities involved in the Dodger move west, and the end of an era in baseball.